As was reported by Thai media earlier it appears Buakaw is indeed finished with K-1 MAX despite his manager’s assertion that Buakaw would return in February 2010. Buakaw now returns to fighting full rules Muay Thai internationally. This time MSA Promotions looks like they are going to match up the Untied Kingdom’s finest with the White Lotus. 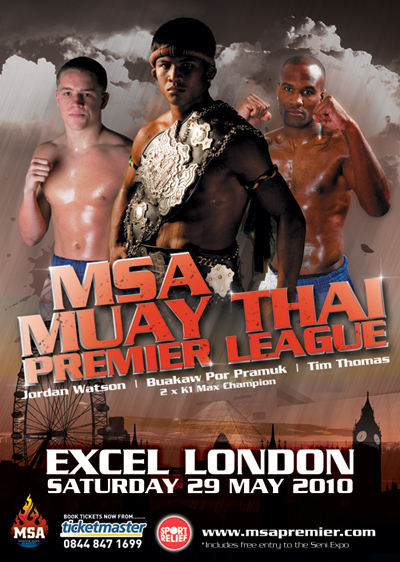 MSA is set to bring the full rules Muay Thai show to London’s Excel on May 29, 2010. Buakaw made his mark as an Omnoi Stadium champion 2X And a Thailand national chamion. Buakaw would achieve true international fame campaigning in Japan’s K-1 MAX promotion where he would win the K-1 MAX champion strap 2X and defeated such notables as Masato, John Wayne Parr, and Kohirimaki. Buakaw Por Pramuk is undoubtedly the number one K1 Max and Thai superstar! Formerly two time Omnoi Stadium and Thailand national champion, he became a true worldwide superstar when he became the K-1 Max World Champion beating none other than John Wayne Parr, Takayuki Kohiruimaki and previous champion Masato in the finals. Many viewers held the opinion that Buakaw should have won the 2009 K-1 MAX championship as well. Tim Thomas will be another headliner on the event. Contracts are pending at time of going to press but his scheduled opponent will be Malaipet Sitpraprom. Malaipet is a well known star in both Europe from the SuperLeague days and the USA where he has fought in Los Angeles recently. Thomas is the current British number one ranked Thai Boxer at welterweight. Alldis is matched against Misty Sutherland of Canada. Other fights to be announced soon.